Like what you see? Be sure to Pin this to Pinterest! 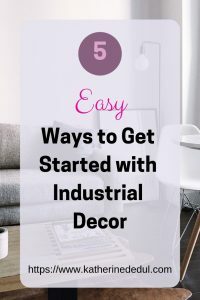 Industrial Decor isn’t a trend for everyone, but if you are a fan of the simple and rustic style of it, then the urge to add pieces to your home decor is probably overwhelming. It can be particularly disheartening to shop for these pieces in stores and find them entirely out of your budget! However, what if I told you that you could do it yourself and it will not blow your budget either? 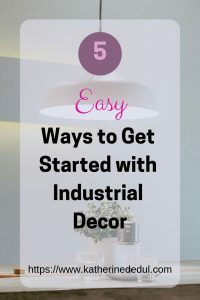 So, What the Heck is Industrial Decor Anyway? 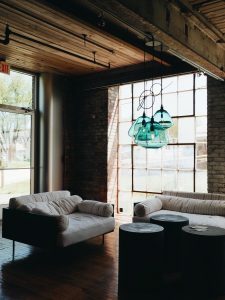 In a nutshell, industrial decor (sometimes called “industrial chic”) is about designing a space that kind of looks like it was a repurposed factory space now doing business as a residential space. It tends to look minimalist with perhaps an edgy unfinished look. 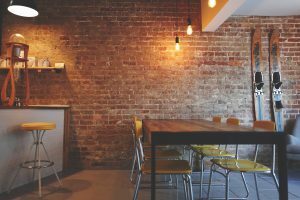 I like the style because it’s got a clean look to it and often features exposed brick walls (which are fantastic). If you’re curious for more details, I recommend checking out DM Lights’ post about it. Another excellent resource is from The Spruce. 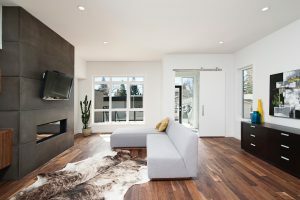 This style is all about “wood pieces that look like they’ve got a story to tell.” You are going to pay a premium for this in furniture stores. However, you can find second-hand pieces and refinish them. Refinishing furniture is a great DIY project for beginners, the only thing to remember is it can get a bit labor intensive! My recommendation is to shop around, eventually, you are going to find what you need at the right price. Hands down, the light fixtures that are part of this decor style are my favorites. 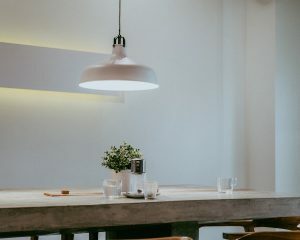 You don’t have to feel constrained to having mangy old lights that you typically think of when you think “factory.” But they are metal with very few (or none) glass accents. 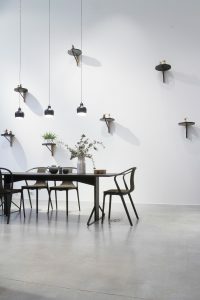 Other tips to do with metal is buying pieces with what I call a “puppy look.” I’ve seen super cool shelving units that capture this look very nice. You can check out one of my favorite youtube DIYers, Alexandra Gater for a cool hack using an old wooden bookshelf and an Ikea bookshelf. 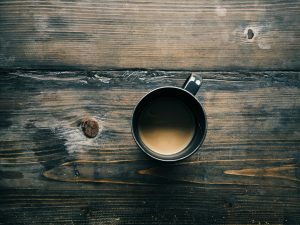 Your floors should be wood or concrete. Tile is very rare in this design style. If you were looking to refinish floors in a room anyway, this could be a great way to capture the industrial chic style. I would recommend a wood floor though, mainly because concrete floors may look too “unfinished” and I feel that they can appear quite cold. Even a weathered style wood floor will add a bit of finished polish to your space. Also, down the road, if you decide to change up your style, wood floors work well with multiple design styles. You shouldn’t feel confined to wood or metal pieces to fill your space, leather couches in neutral colors can really fit in well with this design concept. Second-hand furniture is ideal really for industrial decor because you’re capturing a “repurposed” look. The motto of this design style is “less is more.” Knick-knacks and other figurines are not suited for this design. Which makes it fairly budget friendly right? You aren’t buying a bunch of crap for your space! My one tip for picture frames is to go for metal, mainly black metal. 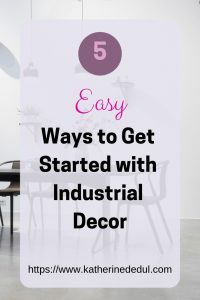 Industrial decor or “Industrial Chic” is a straightforward design to implement if you are a fan of the minimalist styles. I like it because it encourages the use of second-hand furniture and isn’t that expensive to begin to implement. You can, of course, head out to a furniture store like Leon’s or the Brick and pay a premium for this style, but you don’t have to. With a bit of elbow grease, an old wooden bookshelf you found on the side of the road can become a gorgeous wood and metal masterpiece! I hope this article has inspired you to go out and begin to add pieces to your own space. If it has, please share this to Pinterest (or your other favorite social media platform). Next week is going to be all about upcycling things you were going to throw away or donate away, until then, happy crafting!